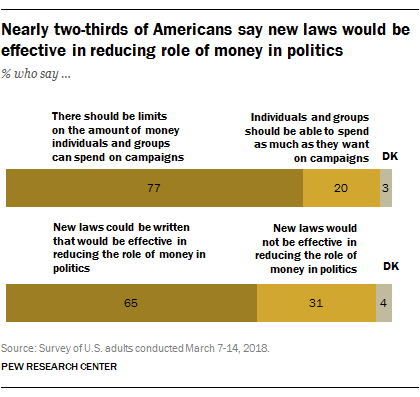 Americans overwhelmingly support limits on political campaign spending, and most think new laws could effectively reduce the role of money in politics. A recent Pew Research Center report finds several indications of public concern over campaign spending. There is widespread – and bipartisan – agreement that people who make large political donations should not have more political influence than others, but Americans largely don’t see that as a description of the country today. And there is extensive support for reining in campaign spending: 77% of the public says “there should be limits on the amount of money individuals and organizations” can spend on political campaigns; just 20% say they should be able to spend as much as they want. A somewhat smaller majority (65%) says that new campaign finance laws could be written that would be effective in reducing the role of money in politics, while 31% say any new laws would not be effective. Democrats are more likely to support limits on campaign spending than are Republicans, and there is a similar gap in views on whether effective laws could be written. Still, 71% of Republicans and Republican-leaning independents say there should be limits on campaign spending and 54% say new laws that would be effective in limiting the influence of money in politics could be written. Among Democrats and Democratic leaners, even larger majorities favor spending limits (85%) and think new laws would be effective (77%). 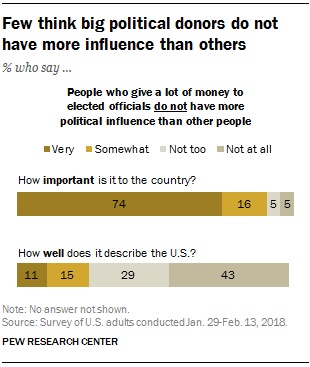 Nearly three-quarters of the public (74%) says it is very important that major political donors not have more influence than others, while an additional 16% view this as somewhat important. Across the political spectrum, few people think that big donors do not command more influence than others: Only about a quarter of those in both parties say this describes the country well. But Democrats are more likely than Republicans (50% vs. 35%) to say this statement describes the country not at all well. Those who have contributed to candidates or campaigns themselves in recent years – the vast majority of whom make donations of less than $250 – are particularly likely to reject the characterization of the country as a place where people who give a lot of money to elected officials do not have more influence than others: 50% say this does not describe the country at all well, compared with 41% of those who have not given a political contribution in the past five years. Those who have contributed money to a political candidate or group in the past year are much more likely than those who have not made a recent contribution to say that their representative in Congress would help them if they had a problem. They are also more likely to say ordinary citizens can do a lot to influence the government in Washington if they are willing to make the effort. Overall, 37% of Americans say that they feel it is at least somewhat likely their representative would help them with a problem if they contacted her or him. However, about half (53%) of those who have given money to a political candidate or group in the last year believe their representative would help. 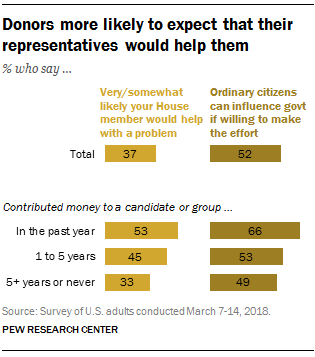 Belief that one’s member of Congress will help them with a problem is highest (63%) among the subset of donors who have given more than $250 to a candidate or campaign in the past year. A similar pattern is seen on the question of whether or not people feel ordinary citizens can make a difference. Among those who did not make a political contribution in the past year, about half say there is a lot ordinary citizens can do to influence the government in Washington. By comparison, 66% of donors, including 74% of those who gave more than $250, say there is a lot ordinary citizens can do to make a difference.